Thanks to everyone who pre-ordered the 25th Anniversary pressing of Scaterd Few’s Sin Disease album. The gatefold LPs are en route from the factory today. Pre-orders should begin shipping out on Monday. We’ll have photos of the final version once everything arrives. You can still order in the online store, but pre-orders will ship in the order they were placed. These will come with download codes for the remastered album as either mp3 or wav files. 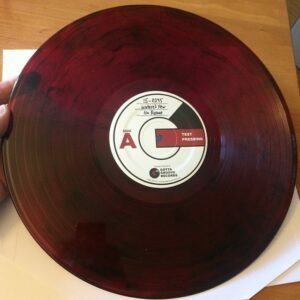 There are a few test pressings left if you prefer to get your LP on marbled red and black vinyl. Also, Allan was interviewed in a two part episode for the As The Story Grows podcast. Worth listening for some Scaterd Few history. The test pre ssings for Scaterd Few’s Sin Disease vinyl release have arrived and they sound great. The final version will be on black vinyl, but there is a short run of test pressing vinyl on red/black marbled vinyl. 20 copies are available in the online store if you’d like this special version. The vinyl ships immediately by Priority Mail and the covers will ship once they are complete. This is on track for a July release. Scaterd Few : Sin Disease LP! 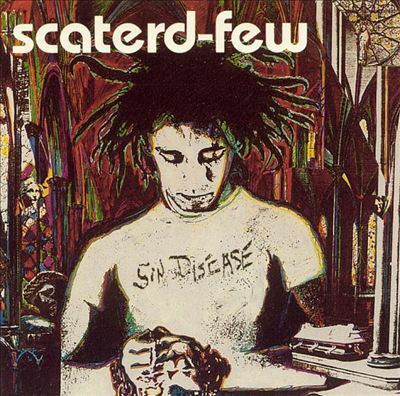 One of my favorite punk albums of all time is Scaterd Few’s Sin Disease which was released in 1990. To mark the 25th anniversary, the album has been remastered and btv will be pressing the album on vinyl for the very first time. This is a limited, one-time vinyl pressing of this classic. It will come with a digital download and be in a gatefold jacket. This is a pre-order and will ship for the July 2015 release date. There is also an option to get the LP with an eBook download that Allan Aguirre is writing about the record. Here they are on video from October 1990 when they toured the west coast with HR from Bad Brains.